Mad Mimic Interactive's cooperative castle defense game No Heroes Here gets a PC release date. More news to come for PS4 and Switch. Mad Mimic Interactive recently celebrated its newest game No Heroes Here being named one of The PAX 10 at the PAX West 2017 event held in Seattle, WA, which recognizes the best indie games at the event based on the quality of gameplay and pure fun. Today, the developer revealed the PC release date for its castle defense title. No Heroes Here is now scheduled to release for PC on October 3 via Steam, bringing its pixel art style to a screen near you. In No Heroes Here, the kingdom of Noobland has become steeped in war and its heroes are nowhere to be found. That means, it’s up to you, the non-heroes to get out there and work as a team to save everyone! 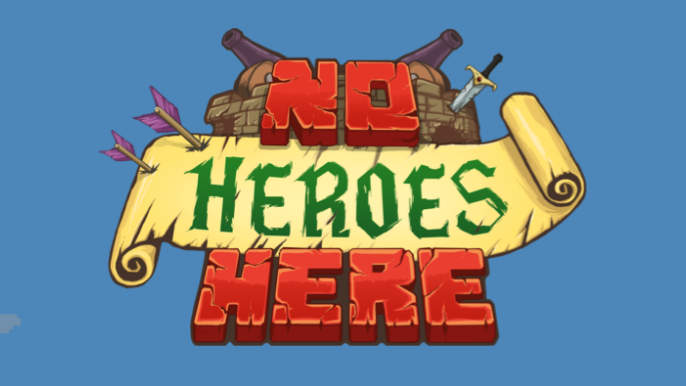 Featuring local and online co-op options, No Heroes Here asks players to lead the charge of crafting new ammunition, loading and firing cannons, and ultimately defending the castle from each new threat. Originally revealed to be a game with only multiplayer modes, No Heroes Here has since been announced to include single-player mode. No Heroes Here will be available on Steam October 3 and is expected to release for PlayStation 4 and Nintendo Switch sometime in early 2018. For more information on the game, you can visit its official website or its dedicated Steam page. Below is the most recent trailer for the game, detailing its cooperative play and crafting elements. You'll now be able to defend castles and fire cannons at enemies on May 29th when No Heroes Here is released for PlayStation 4.